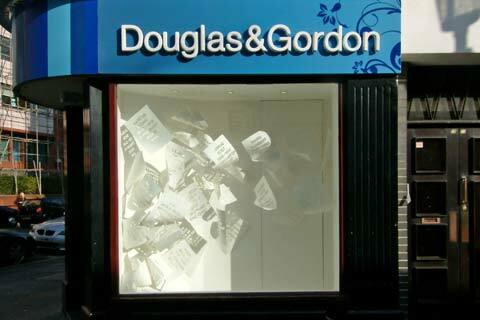 When London-based agency, Douglas & Gordon, acquired a smaller agency at the end of 2007, the start of the recession, the company was faced with a dilemma. Because the Harrington Road site in South Kensington was close to both Douglas & Gordon’s existing South Kensington and Chelsea offices it was decided that instead of subletting it, we would turn it into a street gallery to allow graduate artists and designers to produce and show their own work in this key location. First they commissioned 24-year old graduate from The London College of Communication, Shaz Madani, to create an installation that will engage with the local community. The result is something quite special. The details of all the blue plaques in Kensington & Chelsea laser cut into sheets of paper and suspended from the walls and ceilings, as if the pages of history are sweeping across the three windows. The next artist they commissioned was Jake Blanchard who graduated from Brighton University in 2008, he has already accrued commissions from some notable clients including the Guardian, Random House, the BBC and Nike. His work is typified by bold colours and simple shapes afforded by the screen printing process, with ideas of nature and mythology often forming a thematic focus as in this piece for D&G arts. 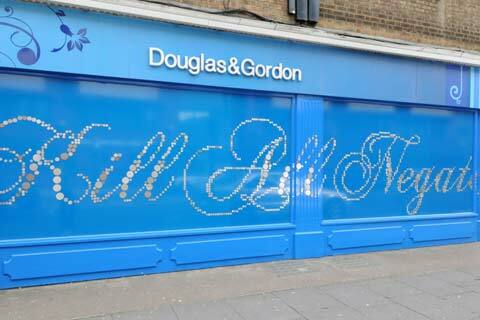 The new installation sees the entire premises painted in D&G blue from top to bottom and thousands of metallic circles have been stuck to the outside. On close examination, they don’t really make sense, apart from being rather intriguing. However, viewed from a distance, suddenly it all makes sense. The silver spell out the slightly inflammatory words “Kill All Negative People”! Ivor Dickinson, Douglas & Gordon’s Managing Director, states: “At this year’s D&G Spring Conference, our guest speaker was Tim Smit OBE who masterminded the Eden Project. Tim’s talk was incredibly inspiring but there were four words which all of us at D&G really took to our hearts and that is when Tim said that his mantra at the Eden Project was “Kill All Negative People”. 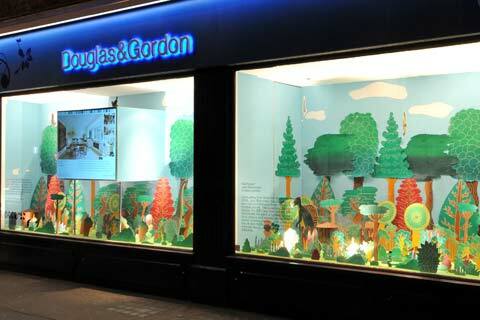 Sadly, this might be Douglas & Gordon’s last installation at the now famous South Kensington landmark as they plan to open a letting office there in the New Year – perhaps, a sign of the property market improving?